Howl! 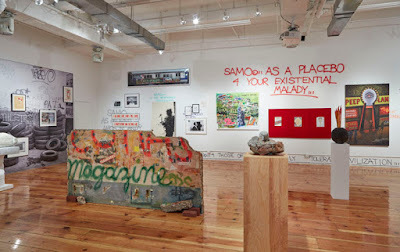 Happening's current exhibit, "Zeitgeist: The Art Scene of Teenage Basquiat," was originally set to close after Sunday. "Zeitgeist" complements the recent theatrical release of Sara Driver’s documentary "Boom for Real: The Late Teenage Years of Jean-Michel Basquiat." That film's run continues at the IFC Center over on Sixth Avenue. Thank you so much--as usual, you keep us up to date on what we need to know about! I thought I'd miss it, but now I can see this exhibit! Much appreciation to you!